is available in 32 and 64 bit. is easy to install thanks to its unique file setup. is guaranteed to be free of viruses, adware, spyware or all other harmful software. Duplicate Media Finder only works with Windows®, from version XP SP1, up to Windows 10 (32 and 64 bit). It is also compatible with the Windows® server from version 2003. You can also connect your smartphone or tablet (Android, iPhone, etc.) 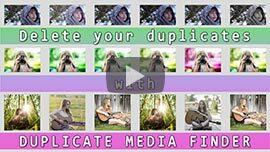 to your computer, and DMF can search for and delete duplicates (1). DMF is by far the fastest duplicate search software. We provide our demo version to test and compare its performance. DMF uses optimized algorithms to reduce the search time as much as possible. DMF takes full advantage of new multicore processes, and can even carry out several searches at the same time. Duplicate Media Finder keeps a fingerprint of each file already scanned in cache memory. Subsequent searches for the same files are therefore incredibly fast. To make it even faster, install the 64-bit version. It is intended for individuals as well as for professionals. It offers all the functionalities necessary to facilitate your work (sorting, decision support...). One single software to scan your PC and the peripheral devices connected to it (smartphones, tablets...). Duplicate Media Finder doesn't delete any files by itself. You have complete control over the files to delete. if you try to delete a system file, it will ask you to confirm your choice. Files that you have deleted from your computer can be restored at any time from the trash. For even more security, DMF gives you the option of moving your duplicate selection into a temporary storage file. You can delete it separately.